Get through my Wonderland maze level to save The Mad Hatter (who was turned into a croquet ball) and bring him back to his tea party. No flying allowed and use the weapon provided and no other weapon tools/packs (however feel free to equip the flamingo croquet mallet to further immerse yourself into Wonderland). The world is a chessboard and the mounts are the pieces (except for the king which is a button moved by magic wand). Play regular chess or extreme. For extreme summon robots to fight when claiming an occupied square and the winning robot's piece stays while the other is captured. Let me know if interested in trying any of them out. Hopefully can find other DI chess players to vs in Chess World. Even new chess players are welcome and I can explain how each piece moves. What's a good way to capture that? On PS4 you can double click the 'share' button and it will start recording gameplay. Double click again to stop recording. Then in the 'Capture Gallery' select the video, press share and it will upload it to your YouTube account. My account name for PS4 is Adornedatom. I'd be interested in your chess game if it can be shared with 3.0 on PS4. Wow, that sounds a lot easier than I was expecting! Does ps3 make recording and sharing easy too? I'm still new to ps4, so would recording and sending to Youtube, sharing toybox with friends, or playing in a toybox together over wifi require paying to join something, or is it free like wii u uses nnids? I do have 3.0 for ps4, but haven't played it yet. But should I be able to put Chess World in that game, def be up for vsing. 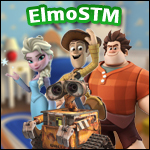 It is free to record and upload, also free to share toy boxes but if you wanted to have friends join your toy boxes with you then you would need ps plus.